Wm. 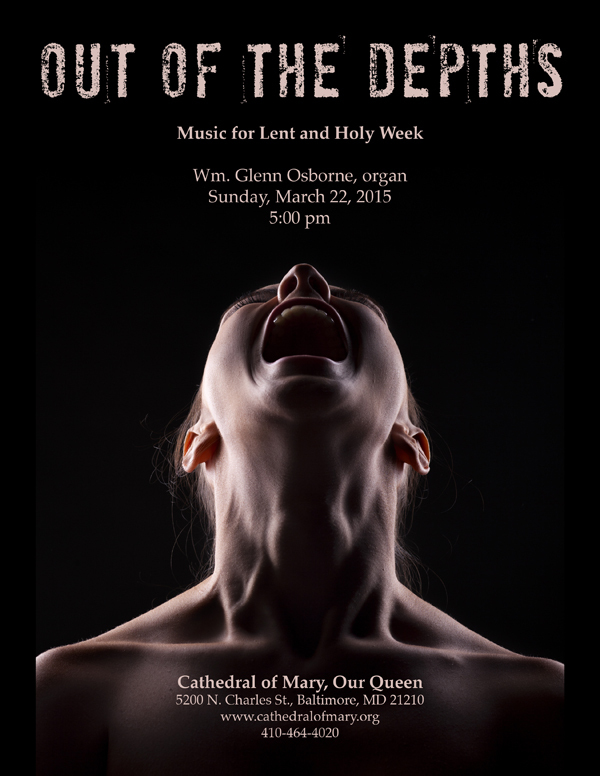 Glenn Osborne presents a concert of Lenten organ music and hymns on Sunday afternoon, March 19 at Trinity United Methodist Church in Mullica Hill, New Jersey. More details to be posted soon. Information on the Steiner-Reck Pipe Organ Opus 104 can be found here. Everyone has heard the expression that to sing is to pray twice. Music provides an additional dimension to our prayers that can add meanings beyond what the words alone can say. Instrumental music therefore can express thoughts and feelings that we may not have found the words to express. While we rejoice the triumph of Jesus Christ over death, there are many stories of pain and suffering also in the Bible: the slavery of the Israelites, the trials of Job, and even the crucifixion of our Lord. The concert this afternoon will explore how different composers have chosen to paint in music these songs of lament. Beginning with settings of Psalm 130 (Out of the depths I cry to you, O Lord), continuing through the triumphal entry of Jesus into Jerusalem, and concluding with the death of Jesus on the cross, the program offers a wide palette of musical styles and emotions that I hope will bring you not into the depths of despair but into a deeper relationship with God. If you are able to be here, please come. More information about the event including a complete program listing may be found here. The Adult, Contemporary, and Children’s choirs of Holy Redeemer will present this opportunity to hear, sing and learn about some of your favorite carols for the Advent and Christmas season. Enjoy a reception afterwards in the Youth Center. Join us for a beautiful, fun and festive evening with your favorite Christmas classics and heart-warming renditions of music you’ll love. From bells ringing and lights gleaming to the warmth of a manger bed, start your season with this annual Christmas tradition for the whole family. Saturday, December 6 at 5:00 p.m. and 7:00 p.m.
Sunday, December 7 at 4:00 p.m.
Tickets for the concerts will be $10.00 for adults and $5.00 for children under 12. Children under 3 are free. 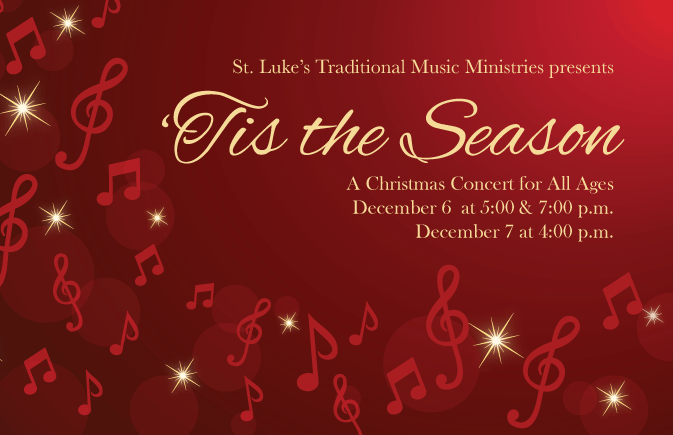 The concert will be in the St. Luke’s Sanctuary. Doors open 30 minutes prior to showtime and concert goers are encouraged to come early as all seats are general admission. Any tickets not claimed at Will Call five minutes before the start of the performance will be released.